ARSix Habits of Really Effective Christians (Parts 5 & 6)The road to being highly successful goes beyond a good title and a high salary. It's being able to look yourself in the face every morning and see a child of God looking back. If you can commit first to shining the light for Christ wherever you are and in whatever you do, time and chance have a funny tendency of working out just right for you.In the last in this series of "In the Workforce" columns, Steve drops us two final tips in the "Six Habits of Really Effective Christians," and concludes with the ultimate source of success. The road to being highly successful goes beyond a good title and a high salary. It's being able to look yourself in the face every morning and see a child of God looking back. If you can commit first to shining the light for Christ wherever you are and in whatever you do, time and chance have a funny tendency of working out just right for you. We now come to the last in this series of "In the Workforce" columns. For the last year now, I've been going through each of the bits of advice that my father gave me before I started working. Here are the last two. 5) Learn as much as you can, so that you are winning two things at one time: your salary and your experience. A lot of people coming out of college receive their diplomas, throw their caps in the air, burn their textbooks in the summertime grill, and think that the learning is over. No more books, no more lectures, no more papers, no more all-nighters. It's probably as close as we'll get to experiencing Revelation 21:4 this side of glory. And yes, there are no more exams. One of the greatest feelings in life after graduation is to wake up after a recurring nightmare in which you're ill-prepared for an exam and, after thinking about it for a few seconds, realize that you've graduated and will never have to take another exam for the rest of your life. Of course, when you start life in the workforce, you'll notice very quickly that the learning continues, but just in different ways. It's not done in a classroom, of course. Classroom learning is no longer anathema; to the contrary, now it's usually accompanied by free lunch or even a "conference" in Orlando. You begin your learning the first day you start work. The first day on a new job is often terrifying. Most of us remember the feeling. You're not sure what to wear. You don't know where to sit. You have no phone, no desk, no computer. You don't know anyone's name, and no one knows yours. You remember vaguely from the interview what sorts of things you're supposed to be doing, but when your boss plops a pile of papers on your desk, it may as well be written in Egyptian hieroglyphics. You smile to the world, but inside you're thinking... what have I done? How am I going to fool these people into thinking they haven't made a mistake by hiring me? Of course, for most people the feeling doesn't last (if it does last, congratulations! You're ready to move into management). No, a week passes, and you spend the time reading and talking to people to find out more about the job you're going to do. After two weeks, you're matching the names with the faces. You're starting to realize that you know just as much as anyone else in the place, and what you don't know, you can learn. After three weeks, your ratio of "dumb questions" to "smart questions" starts to even out a bit. After a month, you've got some simple accomplishments done, and people start to recognize your name. And by this time, new people have come on board, so you can pass the ignominious moniker of "New Guy" to someone else. Getting from ground zero to a point where you feel like you fit in takes work. This is all part of the learning process. But it doesn't just last for a month. It needs to continue for the rest of your life. "The heart of the prudent acquires knowledge, And the ear of the wise seeks knowledge" (Prov 18:15). To be successful in the workforce, you constantly need to acquire new knowledge. You need to learn not just technical knowledge to do your job, but even more importantly, you need to learn how to live. How to write an e-mail that is both respectful and brings your point across. How to conduct yourself in a meeting. How to talk on the phone in a professional way. How to deal with the various personalities that you encounter each day. How to give a presentation. How to deal with success, disappointment, or change. You don't learn these things in a textbook. You learn them by trying to do them, failing, picking yourself up, and trying again. And yes, it does help if you have the word of God planted in you. "The fear of the Lord is the beginning of knowledge" (Prov 1:7). Funny thing is, the more you learn, the more confidence you gain, and the more confidence others gain in you. There are those who remain so stuck in their ways that they refuse to learn. You know the type: these are the people who said that the horseless carriage would never catch on, or asked why anyone would use an electric light bulb when candles and lanterns worked just fine. In the workforce, you'll see these people, too. They're the ones who are so stuck in their ways that they get a reputation for being dead wood. The Bible has a word for this type of person: The Sluggard. Compare the vineyard of the sluggard with the house of the wise. And now, to the last tip. 6) I am sure that after three months, they will not only hire you, they will pay you more! This was not so much a piece of advice as it was a prediction. I had been hired at my company as a consultant, not as a full-time employee. Consultants were hired on a three-month "trial" basis, and, pessimistic ol' me, as I described the job to my Dad, I lamented that I would probably be let go after this period. Dad took my cue and encouraged me with this last tip. Remarkably, he was right. I had started out my career at a job at the very bottom-low pay, long hours, and thankless work. Six months after I started, I was hired as a permanent employee. Six months after that, I got a promotion. Another six months after that, I got another one. And after six months at that position, I finally got one more promotion. Through a combination of fortuitous timing and good luck, not even three years after I entered the workforce, I ended up with a job that I loved and a position and salary that were, at last, commensurate with my skills and education. Some people in the company told me that the norm is to wait years and years to be converted to an employee, or to get even one promotion. But for some reason, while there were bumps along the three years, things did seem to fall into place for me. I didn't need to play the game or schmooze or do anything except be myself. I recall that day, three years into my career, that I started that new dream job, sitting in my new office and smiling. I looked back and thought to myself, here's a guy who, while his alma mater is by no means anything to sneeze at today, went to that university at a time when it was not the most prestigious of schools, and yet advanced over people who went to even the top schools. Here's a guy whose college transcript looks like a can of Campbell's alphabet soup. Here's a guy with practically no social skills and limited business sense, and who, with no false modesty here, honestly has no business at all making it in the corporate world, but somehow ended up enjoying some level of success. Since that time, I've changed jobs, but the Six Habits remain with me. In each new job, they remain a guiding force in whatever I do. I still have that grease-stained, crumpled piece of paper sitting in my desk drawer. If you look back at the Six Habits, you'll see the source of whatever success I've enjoyed. It started with the voice of a loving father, echoing all that he had learned over his life from his loving Father. Some people spend all their time reading up on the latest business trends and catch-phrases. Others make it a priority to go to social events where they can impress and be seen by the elite. Some spend all their efforts trying to take advantage of others for their gain. Some work long hours in the name of providing for their families, while what they should be doing is spending time with the families for whom they are ostensibly providing. Just about all these people have but two things on their minds: I want to make more money, and I want to be promoted to a higher level. This is the big lie that the corporate world dishes out-that somehow a higher salary and a better position will bring fulfillment. It is a lie, because with more money and more power comes a deeper hunger for even more. At the end of that rainbow is regret, not success. No, the road to being highly successful goes beyond a good title and a high salary. It's being able to look yourself in the face every morning and see a child of God looking back. It's doing your work, whatever it is, for the ultimate glory of God. It's having people look at you in the office and know that there's something special about you-something that they can't quite put their fingers on, but something they want to experience, too. It's being able to face successes knowing without a shadow of a doubt who the Source of your strength is, and being in constant communication with that Source. It's being able to face burnout, anger, disappointment, hardships, and the unknown, knowing that, at the end, you will come forth as gold. It's being able to set clear priorities in your mind-that your love for and relationship with God comes first, your family is a very close second, your work for church comes after that, and everything else is a distant fourth. I have no idea where my career will go from here, but if there's one thing that I've learned so far, it's this: the race is not to the swift, nor the battle to the strong, but time and chance happen to all (Eccl 9:11). If you can commit first to shining the light for Christ wherever you are and in whatever you do, time and chance have a funny tendency of working out just right for you. 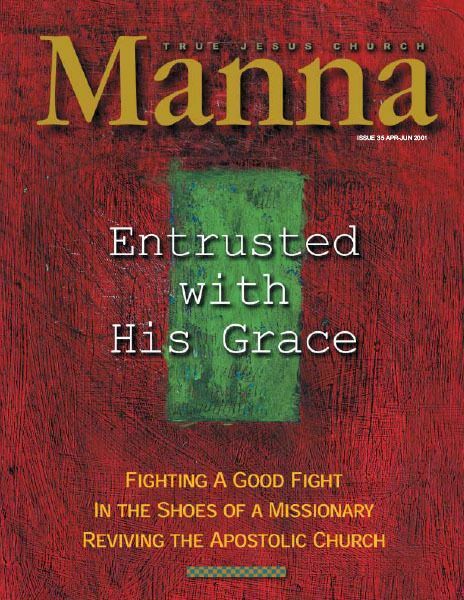 "In the Workforce" is a recurring column in Manna dedicated to survival tips and advice on how to shine the light as a Christian at work. If you have some advice or anecdotes from your own work experience that you feel may be edifying to the fellowship of brothers and sisters in Christ, please send it to workforce@tjc.org. There are countless Christians in various denomination all over the world who truly love the Lord and are very fervent. If a person has to be a member of the only true church to be saved, then will these Christians not be saved?